The Braden family has been going to Perry's for perhaps 20 years or more. We were introduced to it by Bonnie's mother, who used to visit there. What makes Perry's special - a resort that you would go back to year after year? Well, it is on the Atlantic Ocean at Daytona Beach, so that might be enough in itself. And the resort has all the standard amenities: pools, shuffleboard courts, a golf putting green, lawn chairs and tables. But there are a couple of things that make it extra special. First and foremost is what it calls its Garden Apartments. These are two floors of rooms with kitchens that surround a large atrium area that has a large pool and a large hot tub. The pool is not only large, but heated to what we call Florida standards, for all of us whose blood has turned thin. 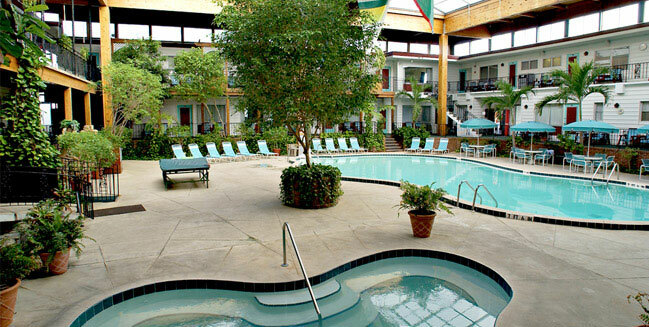 The pool temperature is always at about 88 degrees, and the spa hovers between 102 and 104 - warm! This means that the kids - big kids and small kids - can swim no matter what the weather is outdoors. Too much sun today? No problem; go inside and have swimming fun. And because we stay in the garden apartments, we get to sit outside our room and eat, play board games. or just watch the kids having fun. Second are the morning coffee, donuts, and juice that are offered from 7 to 10 a.m. daily. Third are the activities that are scheduled: Bingo, make-your-own-sundae, horse racing, etc. Somethings each day to look forward to. Fourth, it doesn't hurt to have a Winn Dixie right across the street for easy food shopping. Yes, we know we sound like we are on commission for the place. And there are many people we see who also come year after year to Perry's. No, it isn't a pristine Hilton, but it is clean and it has a comfortable and welcoming environment for guests. 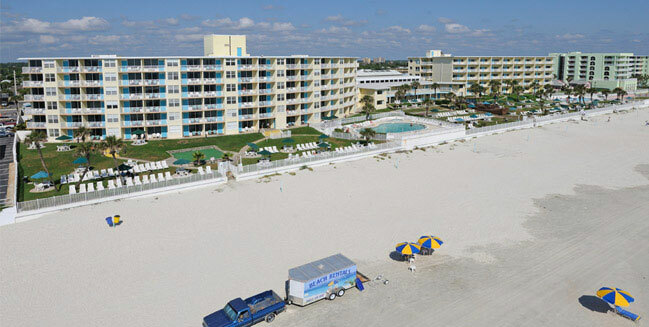 Mix in some swimming, hot tubbing, kickball on the beach, board games, pony races, arts and crafts, good food and snacks, flag football on the beach, Bingo, feeding the sea gulls, and marshmallow gun wars with the family and have a great time!